After almost a full workday comparing the tight scores of each contestant we finally have a winner who won a first place and have the rights to claim a Parrot AR.Drone 2.0 and a Paper Replika T-shirt. For second and third place will also have the rights to claim Paper Replika T-shirts. Judging criteria have been setup so each contestants will have their own advantages in various field. Okay cut the intro, it's time to announce the winners. 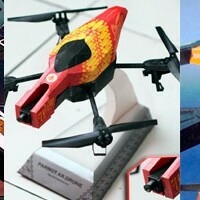 Congratulations to the winners of AR.Drone paper model build and recolor contest. Hi all, it;s been more than a month I had not update any new Paper Replika original model. Now I am back again to make more cool paper model template, let's start with this thing. Do you know on this July Paper Replika will had 4th years online? Yes Paper Replika will has its anniversary on July 17th. This year we got a sponsor to held a paper model recolor contest. 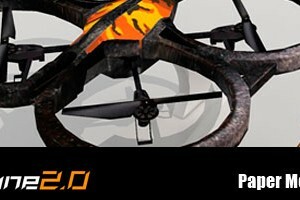 Our sponsor is Parrot with its latest cool RC quadcopter toy, AR Drone 2.0. This quadcopter is very awesome. it has 2 built-in camera on front and on the bottom. It can be controlled with I-pad, I-phone and Android devices (smartphone, tablet, etc). The coolest thing is the patented "Absolute Control" mode, to make it easier to control, even my six years old daughter can control it! It can record your flight via Wifi to your smartphone or to USB flashdisk.